This tour illustrates how to create metallic textures. 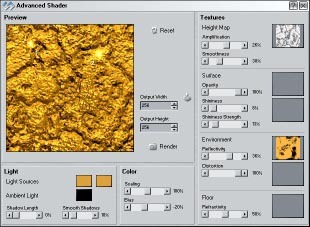 In this example, we will create a gold texture. You should already know how to select functions and load presets. This was explained in the previous tutorials. Create a new 256x256 texture. Select the function Generator/Perlin Noise and its Bumpmap Preset. Apply the function to the new texture. Select the function Noise/Pixel with Default settings. Apply the function five times to the texture (Hint: You can right click the texture and select the 5x menu item). Switch to the Generator/Turbulence function. Run the function on another 256x256 texture. Relative to the Default settings, set the Amplify Value to 500%. Click on the turbulence texture to increase its contrast. Select the function Color/Convert function. Verify that only the Hue and Saturation on the HSV Channels panel are enabled, Brightness must be disabled. Set the Primary Color to RGB(220,160,60) and apply the function to our future reflection map. Launch the Shader from the Tools Menu or with the icon. Load the Bump Map from Step 1/2 as Heightmap. Use the golden Reflection Map as Environment Map. Press the Render button to finish the gold texture.